TitroLine 6000 and 7000 and the new TITRONIC 500 piston burette with innovative features for simple and easy operation-without sacrificing accuracy. High visibility, full color display that can be easily viewed from a distance and at extreme angles. Reagent data is securely stored in the intelligent and interchangeable modules. Automatic wireless recognition of SCHOTT Instruments ID electrodes guarantees accurate calibration and measurements (TitroLine 7000). Touch keypad interface for error free operation. Includes three USB and two RS232 ports for expansion and connection of devices such as USB storage of methods and data, stirrer, laboratory balance, PC and additional SI Analytics peripheral devices. Versatile and flexible for a variety of applications. Size options of 5, 10, 20 and 50 ml. Compact, space saving footprint for when bench space is a premium. All relevant reagent and unit data are stored in the integrated RFID-chip including Burette size (ml), Titrant name, Titrant concentration or titer value of solution and Date of manufacturing or expiration date of the reagent. Plus, additional SI Analytics devices such as sample changers and peripherals. The simple and easy-to-use TitroLine 6000 does not sacrifice performance when doing potentiometric titrations. It is the perfect choice for analysis in food, water, wastewater and environmental applications. Thanks to the high-resolution and precise pH/mV and "dead-stop" measuring interface, it is possible to determine a wide range of parameters quickly, reliably and accurately. High resolution pH/mV electrode and temperature inputs for pH, ISE, redox or photometric titrations. Polarizable electrode input for set endpoint applications. Available standard methods such as FOS/TAC, alkalinity, total acidity in soft drinks. Linear (fixed increment) and dynamic equivalence point titration modes. Titrations to pH, mV and �A end point. Manual titration mode and routine dosing tasks are also available. Dissolved oxygen according to "Winkler" method. Salt content (chloride, sodium chloride). pH-value, total acidity in wine, beverages and food products such as condiments. Formol number in fruit and vegetable juices. Calcium in milk and dairy products. Protein determination (Kjeldahl-nitrogen) in milk and dairy products. Reducing sugar in wine and juices. Iodine number, peroxide number, free fatty acids and saponification number1). Determination of free and total sulfurous acid (H2SO3) in wine and must. Further detail is available in the application example. 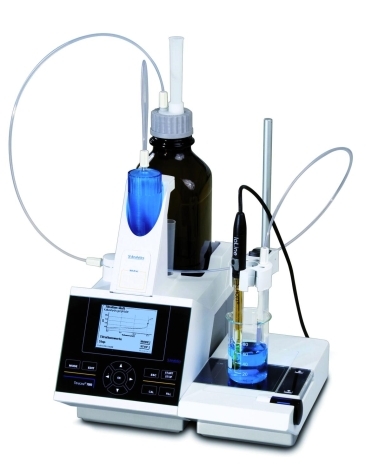 Do you require simple and easy titration but need more features? The TitroLine 7000 offers storage of up to 50 user methods. The wireless sensor recognition automatically recognizes SCHOTT Instruments ID electrodes and instantly stores dedicated sensor data-eliminating measurement and calibration errors. Acid and base numbers in oils. Titrations in glacial acetic acid with perchloric acid. Hydroxyl, NCO (Isocyanate) number and further specific values. Determination of the enzyme activity (ex. Lipase). pH stat elution of soil sample at pH 4. Monitoring of the pH value during chemical syntheses. More equivalence points to expand application possibilities Yes, it is now possible to detect and calculate up to two equivalence points during one titration with the Titro- Line7000. It is possible to determine both the calcium and magnesium hardness individually in a single step, instead of the total hardness combined. The TITRONIC 500 is the ideal piston burette for manual titrations, accurate dosing applications as well as the preparation of solutions. When used with TitriSoft 3.0, it acts as a titration burette or with the TitroLine7000 and TitriSoft 3.0, it is an automatic dosing unit perfect to pre-dose a titrant. Intelligent interchangeable modules with 5, 10, 20 and 50 ml volume capacity. Connect to a printer and/or an analytical balance. Remote control access via RS232 or USB interface. Connect up to 16 devices using the two RS232 ports. The first burette is connected to one PC RS232 or USB port. TL 6000-M2/20 285220080 TitroLine 6000 with 20 ml interchangeable module and pH electrode TitroLine 6000 basic unit with magnetic stirrer (TM 235) and 20 ml interchangeable module (WA 20), with brown glass bottle for titrant, (GL 45) and (S 40)-bottle adapter, tubes, drip tube and titration tip. With pH combination electrode and buffer set. 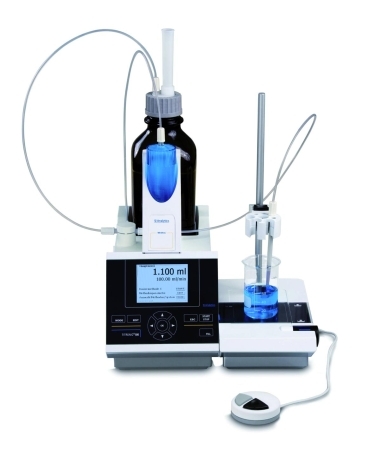 TL 7000-M2/20 285220170 TitroLine 7000 with 20 ml interchangeable module and pH electrode TitroLine 7000 basic unit with magnetic stirrer (TM 235) and 20 ml interchangeable module (WA 20), with brown glass bottle for titrant, (GL 45) and (S 40)-bottle adapter, tubes, drip tube and titration tip. With pH combination electrode and buffer set.